The new Paris Courthouse, with an internal area of around 100,000 square meters, accommodates up to 8,000 people per day. 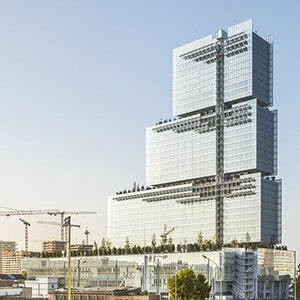 The building has a plinth ranging from five to eight stories, on top of which stands a tower of three superimposed parallelepipeds, whose section diminishes as the tower gets higher, creating a distinctive stepping profile. The tower’s outline breaks in two places, on the 19th and 29th floors, where “hanging gardens” have been made. The building is entered from the piazza, into the monumental public lobby, where visitors and employees are greeted and directed. This rectangular space is the full height of the plinth, up to 28 meters, and is notable for its slender steel columns and the volume of natural light that enters via skylights and through the glazed façade. Via this monumental room and the two small atria on either side of it, natural light can penetrate the heart of the building. The plinth contains the public areas, including 90 courtrooms.